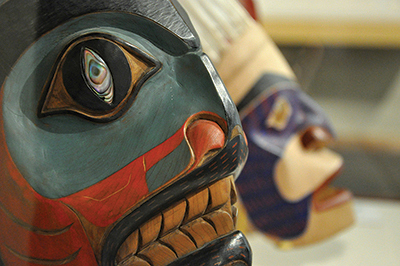 Sealaska Heritage Institute (SHI) is planning a retrospective on the famed Tlingit artist Nathan Jackson, clan leader of the Lukaax.ádi, and is currently seeking pieces. The exhibit will feature work made by Jackson from the institute’s collection and pieces on loan. SHI currently is seeking carvings, jewelry, prints and any other items made by Jackson for the exhibit and is appealing to the public to participate in the project. The items would be featured in the exhibit from April 1 to October 15, 2019. Pieces would be chosen at the discretion of SHI. Jackson learned to carve in the 1950s at a time when Native people were in danger of losing knowledge of ancient art practices. Since 1967, he has been creating masks, panels, house posts, totem poles, and jewelry using traditional Tlingit Northwest Coast formline design in his own unique style. Jackson’s goal is to ensure that the traditional art forms are not lost, and he has mentored many Native artists. He was designated a national living treasure by President Bill Clinton. The exhibit gallery at SHI is named in his honor. He also serves on the institute’s Native Artist Committee and guides SHI’s art programs. People who own pieces by Nathan Jackson and are interested in loaning them for the exhibit should contact Collections Manager Heather McClain at heather.mcclain@sealaska.com or 586-9202. Caption: Foreground, mask made by Nathan Jackson from SHI’s ethnographic collection.